Bernice Marjory Simmons Thompson was born June 25, 1927 at Scandia, Kansas and adopted at two weeks of age by George and Ester Rosene Simmons. 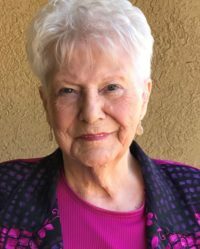 She passed away on May 12, 2018 at Tucson, Arizona at the age of 90 years, 10 months, and 17 days. She grew up on the family farm in the Sherdahl Hill area north of Scandia. She attended District 24 Pleasant Valley Grade School and Scandia Rural High School, graduating with the class of 1944. On August 21, 1944, she married Alva Thompson. They lived on the farm at the west end of the Republican River Bridge in Scandia and farmed several sections of land west of Scandia along Highway 36. To this union, three daughters were born: Judith, Colleen, and Nancy. She was a store and pharmacy assistant at the Haggman and Wires Drug Store in Scandia from 1960 to 1966. After a few months working at MC Industries in Belleville, Kansas, she was employed for 25 years as secretary for Scandia Rural High School, which later became Pike Valley High School. She belonged to the Order of Eastern Star, Amana Lutheran Church, and was a founding charter member of the NOYB Club. She loved to sew, quilt, read, play card games, and watch sports games. She also loved to travel and reached her goal of visiting all 50 states in the US. In 1999, she moved from the farm west of Scandia to a house in Scandia. In 2009, she relocated to Tucson, Arizona to be closer to family. She recently lived at Fairwinds-Desert Point Senior Living in Oro Valley, Arizona. She was preceded in death by Alva, her husband of 46 years, and parents, George and Ester Simmons. She is survived by her children: Judith (Charlie) Huffman, Colleen (Mel) Cailteux, and Nancy (Lorraine) Nobert; grandchildren, Kyle (Elizabeth) Serra, Shawn (Pam) Cailteux, Cheree Frank, Melissa (Paul) Lin, and Chad (Kaela) Nobert; great grandchildren, Noah Frank, Isabella Frank, Jaden Cailteux, and Justin Cailteux. She is also survived by sister-in-law, Glada Isaacson, nieces and nephews, extended family, and friends. Funeral services will be held at 10:30 AM, Saturday, May 19, 2018 at the Amana Lutheran Church, Scandia, KS with PMA Al Urich, officiating. Interment will be at the Riverview Cemetery, Scandia, KS. Friends may call from 1 PM until 8 PM on Friday at the Bachelor-Surber Funeral Home, Scandia, KS where the family will greet friends from 6 PM until 7 PM. The casket has been closed. Memorials may be given to USD Pike Valley Schools Endowment Fund in care of Tanner Johnson at the Swedish American State Bank in Courtland, Kansas or the Amana Lutheran Church. Bachelor-Surber Funeral Home, Scandia, KS is in charge of the arrangements.